Are you a fan of the Indiana Jones movies, but can’t see spending $600.00 -$1000.00 on a leather replica of Dr. Jones’ famous whip? I’m happy to offer a solution: The Cowwhips.com Indy Style Nylon Bullwhip! While nylon bullwhips are not considered “screen accurate,” I can build you a nylon bullwhip that is similar in design to the whips used in the movie –and at a fraction of the cost! As with all of my nylon bullwhips, this whip is shot loaded and built from top quality nylon cord with 2 plaited bellies and a 16 plait overlay. The fall is made of white nylon to simulate the look of the whitehide falls that were on the original Indy whips. The whip weighs in at 1 lb., 6 ounces and has been dipped in paraffin; so even if you’re on an adventure and end up in a river, your whip will be just fine. This whip cracks loud and with ease. 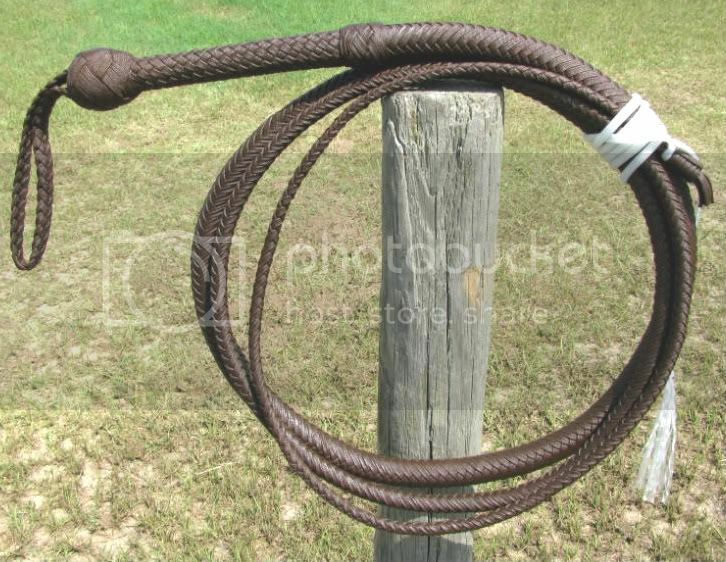 For nylon Indy Whips at unbeatable prices,think Cowwhips.com! This entry was posted on Wednesday, July 29th, 2009 at 8:49 am	and posted in bullwhips, Indiana Jones. You can follow any responses to this entry through the RSS 2.0 feed.